Wet scrubbers are a type of air scrubber employed in a broad range of industrial settings to reduce or eliminate various pollutants found in a given air stream by absorbing or dissolving them in a liquid solution. Wet Scrubber – Anguil Environmental Systems, Inc. While both gaseous impurities and particulates can be removed in this purifying process the optimal operating conditions for each differ and often chemical reactions or absorption techniques are configured for one type of contaminant or another. Depending upon the specific gas and contaminant combination, the process stream from the wet scrubber is either forced through a liquid spray or through a pool of scrubbing solution. A properly configured wet scrubber can have a removal efficiency rate as high as 95%. This form of air pollution control can operate at various temperatures and moisture contents, allowing for such efficient decontamination of a process stream in a number of environments. The versatility of wet scrubbers makes them popular in construction, fertilizer, steel mill, power generation, paper and pulp, manufacturing, and propane or natural gas related industries. Pollutants produced in these environments, such as volatile organic compounds, hydrocarbon, and solvent fumes can have serious environmental and biological ramifications if not properly disposed of. For this reason, the EPA and other organizations encourage and even require the use of wet scrubbers and other emission control systems. Though configurations and operations may differ significantly, the basic components of wet scrubbers are similar across the industry. Every arrangement needs ductwork and a fan or pump system to draw or push the polluted gas into the collection area or chamber. A pump is also required to pressurize the liquid scrubbing solution or air stream depending upon the specific configuration. The two most basic types of wet scrubbers are spray and pool scrubbers. In the former, pressurized cleaning solution is sprayed into the moving air stream. The liquid attracts heavier particulates causing them to disengage from the gas and instead attach to the liquid which then collects in a chamber. Used liquid is cleaned and often returned for reuse. A pool scrubber requires a saturation chamber. The gas stream is forced through this pool of scrubber solution which collects and binds contaminants while allowing the air stream to pass. Chemical solutions may also be used in either instance to destroy or reconfigure harmful pollutants as needed. Additional filters can be added both before and after scrubbing for increased efficiency. Pre-filters are often employed to enhance efficiency as they collect larger pollutants, allowing the scrubber to focus more keenly on smaller particulates. Final filters may also be used at the exhaust end of wet scrubbing. Like the solution, the clean air may be returned to circulation, though it is commonly expelled into the atmosphere. Although permanent mounted industrial wet scrubbers were once the norm, scrubbers have also become smaller, more portable and even mobilized devices for localized cleansing. How Does A Wet Scrubber Work? Wet scrubbers—specialized emission control systems—derive its name from the action it employs to remove of air pollutants. It largely uses diffusional or inertial impact of liquid solvent, absorbent, or reagents to settle down Particulate Matter (PM), Hazardous Air Pollutants (HAP), vapors, gases, and inorganic fumes. The name of the scrubber varies when used for specific purpose, for example, to filter out or regulate sulfur dioxide (SO2), Flue-Gas Desulfurization (FGD) is used; similarly, to regulate inorganic gases, the scrubbers are known as Acid Gas Scrubbers.”However, all these equipment fall into air pollution controls category, which collectively is known as spray-chamber or spray-tower air pollution scrubber. In air scrubbers chamber, spray nozzles are installed that release liquid droplets at high rate that comes in contact with the gas stream in empty rectangular or cylindrical chambers, based on the design, which is determined by the purpose. Whereas in a standard spray tower, the gas moves upward through a cache or banks of spray nozzles that captures the particulate matter. Sometimes, the same arrangements of nozzles are found in spray chambers where gas flows horizontally. This type of devices has low gas pressure drops, and to achieve the appropriate contacting power a combination of flow rate and liquid pressure is used. What determines absorption of pollutants? The physical absorption of pollutants is largely determined by the properties of the liquid solvent and gas stream, like viscosity, density, along with the specific properties of the pollutants in the gas and the liquid stream, like equilibrium solubility and diffusivity. These all properties vary with temperature, thus are temperature dependent. As a thumb, at lower temperatures, the absorption of gases by the solvent is favorable, generally. To enhance the absorption, the contacting surface should be greater, and the liquid-gas ratios and the concentrations should be higher in the gas stream. It is found that chemical absorption can be limited by the rate of reaction. In the entire process, the rate-limiting step is the physical absorption rate. To remove inorganic pollutants, water is commonly used as a solvent. The removal of pollutant can be enhanced by changing the chemistry of the absorbing solution, for example, for acid-gas absorption, a caustic solution works better than pure water, similarly, hydrophobic VOC are removed by adding amphiphilic copolymers with water. 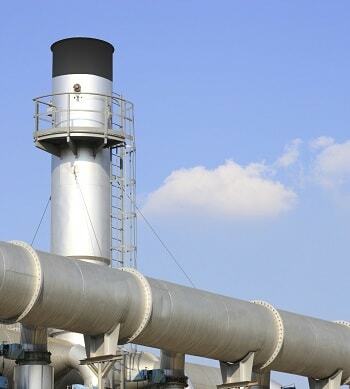 For inorganic gases control, Flue-Gas Desulfurization is used, which either can be horizontal or vertical, based on the application. 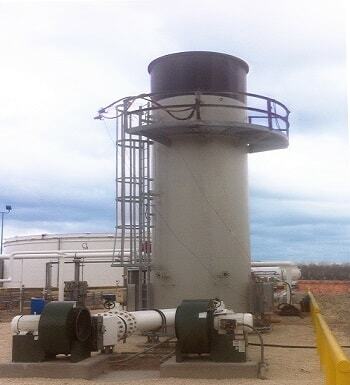 For particulate matter control, usually a standard spray towers prove efficient. Sometimes, a cyclonic spray chamber is utilized, which more or less is similar to spray chamber, however, it is designed to introduce the gas in the chamber to produce cyclonic effect inside the chamber. For volatile organic compound control, a more sophisticated system is needed, which involves chemical reaction. As the contaminants are volatile, special counter-current spray towers, or plate or packed columns are utilized. Invariably, these types of pollution control equipment are used in most of the industries; however, to achieve specialized results, some custom made scrubbers are also available. Given the stricter emission regulations, it will be no surprise that new emission control systems will crop up in near future. However, until then scrubbers are what you need as air filtration systems in your facilities. A wet scrubber is a device that industries use to reduce or remove pollutants from their exhaust streams. The gases a wet scrubber addresses are released by industrial exhaust and can contain several harmful solid pollutants and gaseous chemicals. Scrubbers filter the gas and eliminate any possible effects. Wet scrubber devices clean polluted air, fuel gas, liquefied gas, and pollutants from an exhaust stream and help a manufacturing company to meet strict environmental standards and regulations. Using a wet scrubber within an industrial air stream system is the safest and most effective way to reduce pollution. The wet scrubber cleanses the exhaust flow and discards the contaminants safely. The wet scrubbing process utilizes water or other liquid composition to scrub the course. Scrubbing cleanses the gases, catches the particulate matter, and produces air that is safer for the environment. A more technical name for wet scrubber is a gas desulfurization system. As this term suggests, the system removes particles made of sulfur, such as sulfur dioxide, sulfuric acid, etc., from the air flow. Sulfur is one of the most poisonous elements that industrial processes release into the environment. Wet scrubbers use innovative methods to reduce the sulfur content being produced by many industrial processes, especially those that utilize coal as fuel. An exhaust stream passes through the absorber unit of a wet scrubber device. This is where the chemical and mechanical procedures happen, and the gas is disinfected from the sulfur content. Sulfur dioxide is a poisonous gas that is released from coal-based industrial operations. The amount of sulfur dioxide freed by industries is very high. To save the environment, it is important to put air filtration units in place. Wet scrubbers create an atmosphere in which sulfur reacts with the water and give it a new chemical composition. Before being scrubbed, gas has to go through a mixture of pulverized limestone and water or some liquid. Water is strategically sprayed into the gas or air flow. As the gas navigates through this process, a chemical reaction between the water and sulfur particles occurs. This chemical reaction produces a byproduct, calcium sulfate, which is used to produce dry wall. What is included in a wet scrubber system? A typical wet scrubber system includes scrubbing plates, a fan or exhaust system, pump, supply or outlet pipe, ducting, mist catcher or eliminator, and air filter. Manufacturing companies often use wet scrubbing system to meet the environmental control regulations posed by their production capacities. Made from durable materials, wet scrubbing devices can work under high pressure and temperature gas outlets. In fact, wet scrubbers cool down the temperature of hot gases in addition to neutralizing noxious and inflammable gases. Coal refineries, chemical plants, metal mines and manufacturing units, recycling businesses, and production plants that use coal or release gases or dirty water freely into the environment in corporate wet scrubber technology within their exhaust streams. With wet scrubbing, manufacturers can process using both gas and water. Wet Scrubbers Wet scrubbers are a type of air scrubber employed in a broad range of industrial settings to reduce or eliminate various pollutants found in a given air stream by absorbing or dissolving them in a liquid solution.